Making a wool pom-pom wreath is a super-fun DIY project that results in a wreath that can be used again and again (see the update at the end of the post!) and even makes a great transition piece into January winter decor. The garland is so cute, too, and takes less time – you’ll find yourself using it all over the house! 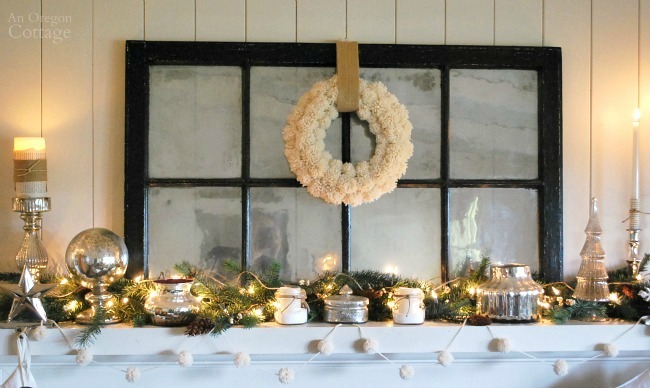 When I shared our silver, white & burlap Christmas mantel, I promised to show you how to make your own wool pom pom wreath and garland for a fraction of the price of the store-bought versions- and while I mentioned that they do take some time to make all the pom poms, I didn’t tell you how FUN they are to make! I mean, they’re pom poms. Don’t pom poms just seem fun? My daughter and I sat down to watch a holiday movie and just cranked them out. It probably helps that they are so cute, too. Here’s what started with: two .99 thrift store skeins of creamy wool and a wreath form for .49. 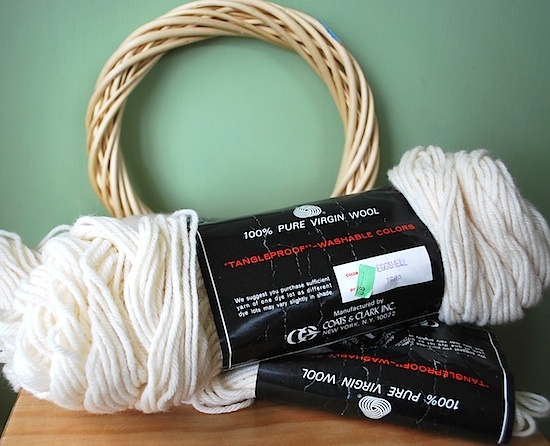 So just for fun, let’s do the math: I paid $2.49 at the thrift store and a few more cents for some cotton yarn to wrap the form in which brings the total to something under $3.00. The higher-end store version? The wreath and garland would sell for a total of $166.00 (plus shipping) – crazy, right? 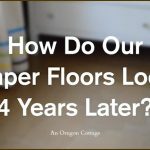 Want to save big bucks, too? 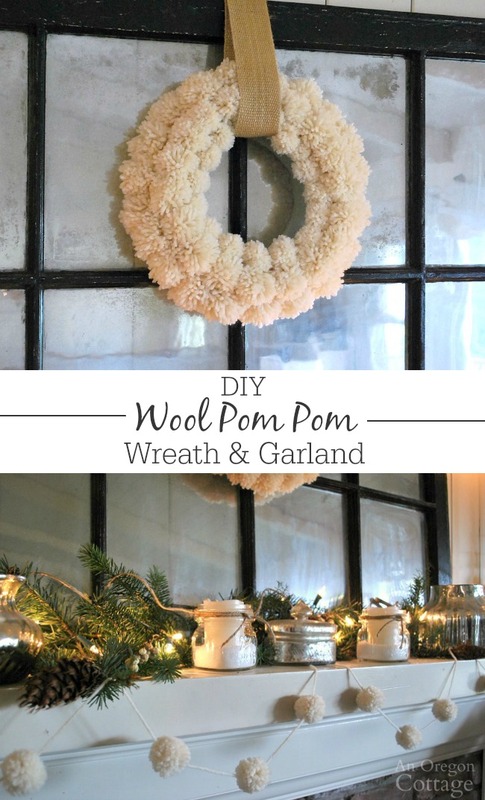 All it takes (after your few dollars) is time making a lot of pom poms – first for the wreath, and then for the garland. It does take a few hours, so find a movie (or two) you’d like to watch and maybe even a friend to enlist (or a daughter, like I did!) to help and before you know it you’ll be gazing at your high-end wreath you made for pennies. Wreath form (I used a 9″ form and ended up with a 12″ wreath – the Anthro version is 22″ as a comparison, but you’ll need to make a LOT of pom poms)- when looking at thrift stores or to buy, look for rounded styrofoam, straw wreaths, or the bent-wood type I found (I’m not sure it’s called), not grapevines, metal, or flat craft wreaths. Yep, I pull out all the stops here. You can make one, too (I know you want to) by simply hammering six long headless nails into a scrap piece of wood about 8 inches long. 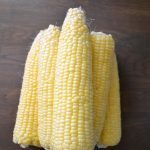 Make two of them 3-inches apart on one end, the next two 2-inches apart hammered about the middle of the board, and the last two 1-inch apart on the other end. Whew. That was hard. Better go take a coffee break. 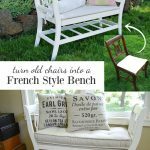 If you don’t want to DIY your own (hard to believe…), though, you can also use thick cardboard cut into 1,2, & 3-inch pieces to wrap the yarn around if you don’t have scrap wood and nails hanging around. The reason I like the wood-nail version is because I find it easier to get the pom poms to be similar sizes (the nails are only so long…) and the cardboard ends up bending after a few uses. Wrap yarn around two nails. The more yarn, the thicker the pom pom. Experiment to see what you like and then eyeball that same amount for each pom pom. It’s not exact, as you can imagine, so don’t sweat it too much. Cut the yarn. Cut a piece of yarn 5-6″ long and push it between the wood and the wrapped yarn with your finger at the middle. Tie it as tight as you can and knot it to secure. Slip the yarn off the nails (the reason why they need to be headless nails) and use scissors to cut all the looped ends. The pom pom will be essentially done, but may be a bit lopsided. 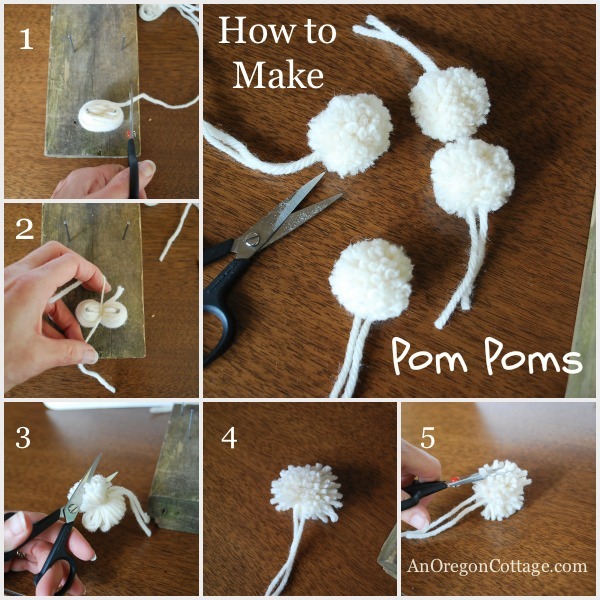 The smaller pom poms are usually more oblong at the initial cutting. Trim it up with the scissors to create round balls. The 1-inch balls will need more trimming than the bigger poms in order to be round. 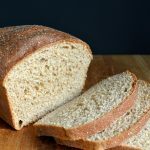 There you go – now just make a lot. And then make some more because it won’t be enough (and I’m not joking…). After looking closely at the Anthro wreath, it seemed they used different sized pom poms, so I used three different sizes on the wreath: 3-inch poms on the outside of the form, 2-inch poms on top, and the smallest 1-inch size on the inside (which you probably already figured out from the pom pom maker, but clarification is good, right?). Wrap the form with yarn. Use the same yarn if you have enough or a matching yarn. I used a cream colored cotton yarn I had because I didn’t want to use up the wool on this part. I could easily tie the beginning and end to this type of form, but if you are using a straw or styrofoam form you can use hot glue. Attach the outer pom poms. I wanted to be able to adjust the pom poms on the wreath, so I used a yarn needle and the tails left on the poms after making to attach them, tying them securely and clipping the ends. Hot glue is another option for attaching, but of course they’re set in place then. Finish attaching the pom poms. After completing the outside, attach the 2-inch poms to the top center and then end with the inner row of 1-inch poms. Tying the pom poms made it easy to adjust how close the pom poms were to each other as I went along so that the form could be completely covered. Note: You may want to trim your pom poms into more rounded shapes after they are all attached, as well, depending on the look you’re going for. After I finished the outside and part of the center rows, my daughter mentioned that it looked like a shag rug. NOT the look I was going for. A bit of trimming to better see the pom pom shape and I was loving it again. I used all small, 1-inch pom poms for the garland, though alternating with all three sizes would be a fun look, too. I sized it to fit my mantel which ended up being a 6-ft length – the exact size of the Anthro version. But of course when you do it yourself you can customize it to any length you’d like. Cut a piece of yarn to your desired length of finished garland, plus an inch or two for knotting. Thread a yarn needle (or similar large-holed needle) with yarn and sew through the middle of one pom pom that has tails. Tie the end of the long yarn piece to one of the tails as close to the pom pom as possible. Secure with a knot and clip the tails. Use the needle to sew through all the other pom poms, spacing them evenly along the length of yarn (my 6-ft garland has 14 pom poms, as an example). Sew through the last pom pom and tie off as you did the first one, clipping all the loose ends. I really am enjoying this fun pom pom look and how it’s different from the normal wreath and garland. What do you think? 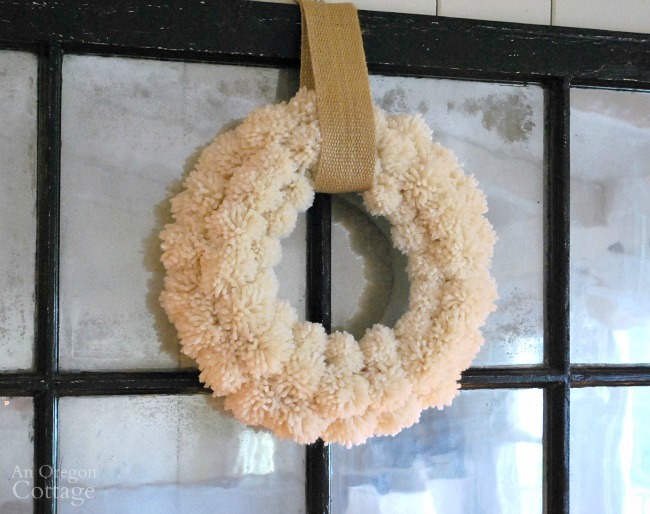 Did you see the Anthropologie wreath, too, and like it? Think you’ll make these, too? 2013 – Still on the mantel, but the colors are green and white. 2014- The wreath moved to the door of a rustic cabinet in our entry. 2015 – The wreath held a place of honor on our Christmas chalkboard. Hi. I made a few Pom Pom wreaths and the back of the wreath look messy with all the tails of yarn. Do you have a way to make it neater. ? I just cut the tails off. The catalog photo I have shows it was $38 for a 6-ft. long garland, Pennie – and they don’t take nearly the time that the wreath does, so it’s a DIY no-brainer. You’ll save big time. 🙂 Have fun! Excellent. Thank you. Also, roughly how much spacing between the poms on your garland. Thanks again. 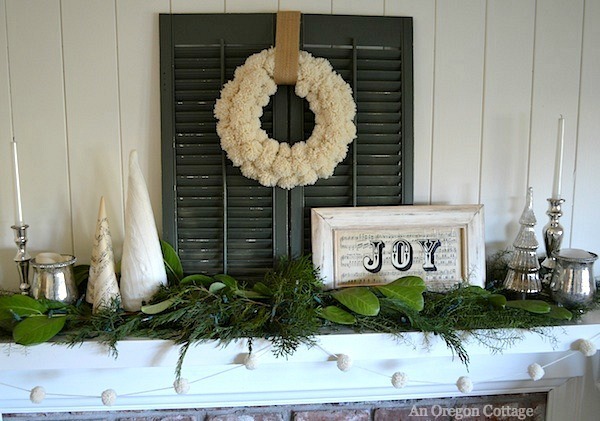 I came here from Pinterest because I both wanted to see how you made the wreath AND because I wanted to see the old window on your mantel. I have an identical one with a sprayed mirrored finish on one side and ONE coat of black paint in my garage. I lost steam and never have put the second coat on. You’ve inspired me to change that situation. Especially because I’ve grown tired of my round mirror above the fireplace and have been thinking about what to replace it with. Thank you!! Love your ideas! I have bought thrift store sweaters to unravel just for the yarn. This would be fun with different textured yarns…cashmere,wool etc. What a great way to get consistent looking pom poms! I used my hand to make pom poms for a project. I love pom poms so much! Pinning this! 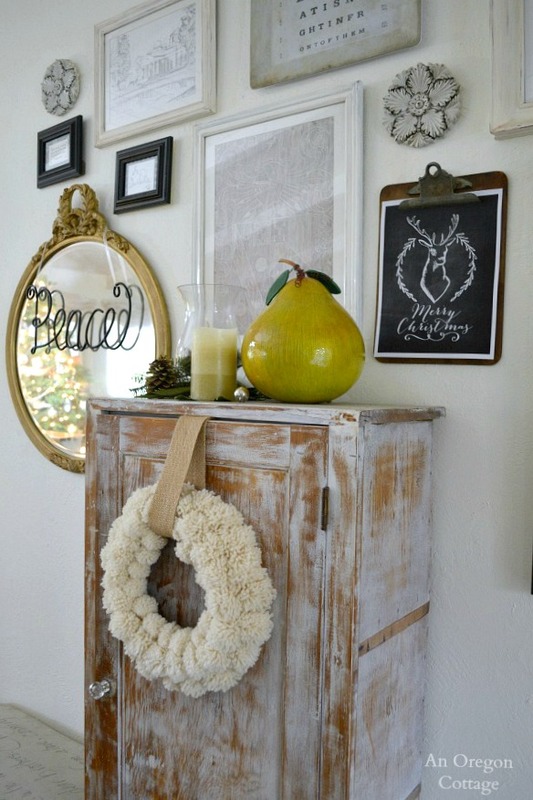 Lovely wreath and also love the pom pom garland! Nice job! Have a great weekend! Thanks for the encouraging words, Roeshel! 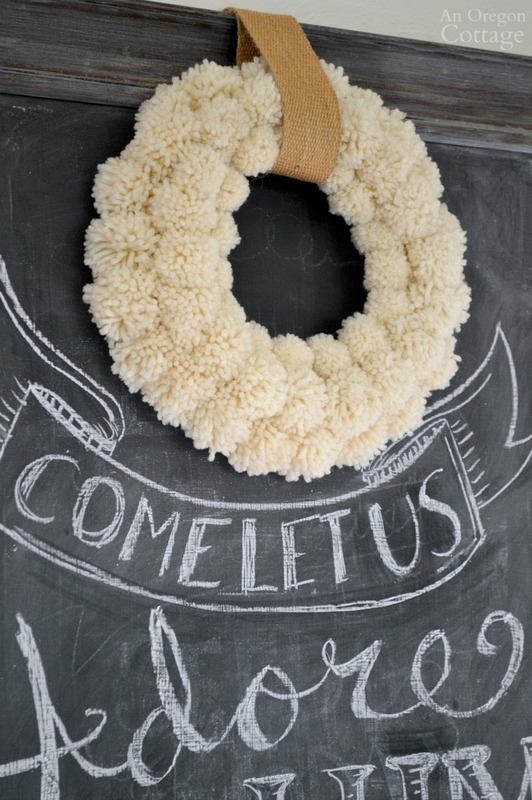 There are a lot of examples of the pompom wreaths out there, but yours is one of the nicest. 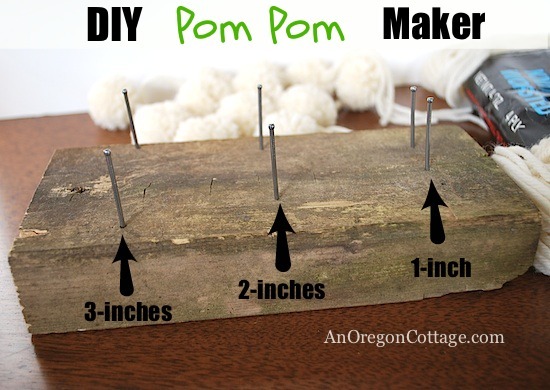 I also like the wood block for making the pompoms. That looks like a great method. Thanks! I love your knockoffs! They are gorgeous and thanks for the great tutorial! I found you at Centsational Girl’s holiday party. Have a great weekend! 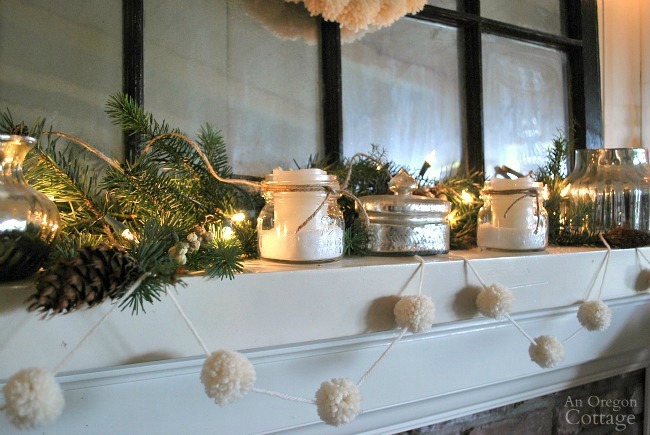 Your mantel and pom poms look great! 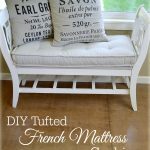 I’m definitely going to give this project a try! Love this project – you are so creative, you inspire me! 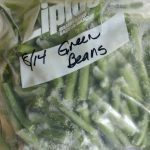 I absolutely love this project… thank you for providing the tutorial. I can’t wait to try it myself!